BRUSSELS, Belgium, 2015-11-16 — /Travel PR News/ — In the month of October Brussels Airport again received more than 2 million passengers, an increase of 6.4% compared with October last year. Freight transport also rose significantly, with an increase of 7.3% over October 2014. The number of flight movements remained stable in comparison with October last year. 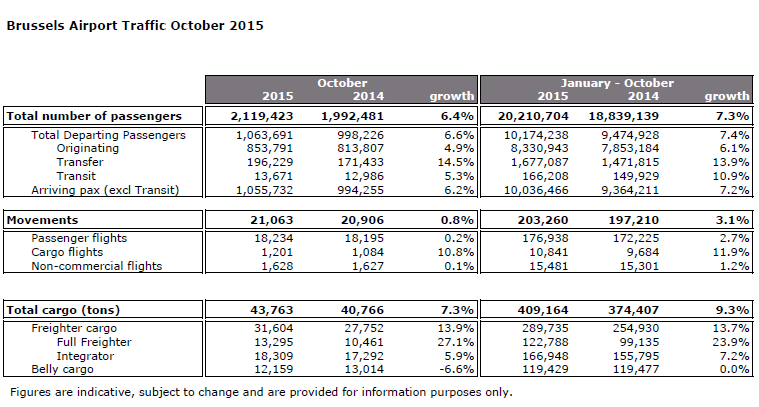 In the month of October, 2,119,423 passengers visited Brussels Airport, a growth of 6.4% compared with October 2014. The number of transfer passengers, in particular, grew strongly: up 14.5% on the same period last year, thanks to the strong performance of Brussels Airlines and other Star Alliance partners. The growth is seen in every segment. Growth in the short-haul segment was driven mainly by Brussels Airlines and the low-cost companies, while in the long-haul segment all airlines performed well. Since 25 October, the Japanese company All Nippon Airways has been contributing to this growth, with a daily flight to Tokyo. The freight volume at Brussels Airport rose in the month of October by 7.3%. The full freight segment showed particularly strong growth of 27.1%, thanks to the arrival of new airlines at Brussels Airport. The suspension of the activities of Ethiopian Airways, is expected to have a negative effect on growth in the coming months. The express services, too, such as DHL, grew by 5.9%. Air freight transport showed a decline across the whole of Europe. When it comes to belly cargo, down by 6.6% in October, Brussels Airport is no exception. The number of flight movements at Brussels Airport remains more or less stable. Overall, the increase was a mere 0.8%. The average number of passengers per flight rose to 116 compared to 110 in October 2014. This entry was posted in Airlines, Airports, Flights, Travel Management, Travel Services and tagged Air freight transport, Brussels Airport. Bookmark the permalink.